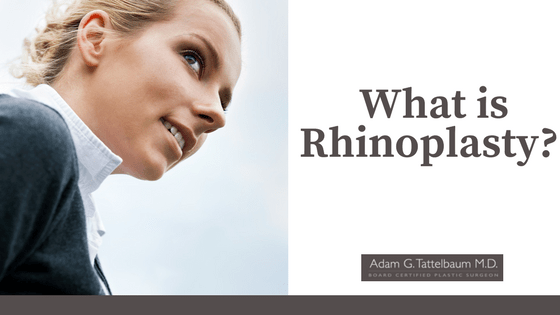 What is Rhinoplasty? - Adam G. Tattlebaum M.D. Home » Blog » What is Rhinoplasty? Rhinoplasty is the shaping of your nose. Often, patients call this procedure a nose job or a nose reshaping. The exact name of this procedure is not as important as understanding that this surgery can enhance the natural harmony of your face, and help you achieve the look that you want. Every year, cosmetic surgeons perform many rhinoplasties. In 2016, American plastic surgeons performed more than 223,000 nose jobs. Between 2015 and 2016, the number rose 2%. We cannot speculate on what will happen in the future, but as plastic surgeons in Rockville, MD, we want you to know about rhinoplasty here and now. The oldest surgical treatise, the Edwin Smith papyrus, mentions repair for a broken nose. The Indian ayurvedic physician, Sushruta, described nasal reconstruction techniques as early as 600 BCE. Man’s desire to reshape the nose is as old as history. The term rhinoplasty comes from Greek. It is composed of two words, rhis, meaning nose, and plassein, meaning to shape. Jumping ahead a bit, anesthesia for surgery on the nose and ‘closed’ rhinoplasty came about in the middle of the 1800s. In the early 1900s, Freer and Killian pioneered techniques for correcting the deviated septum. In 1921, Rethi introduced ‘open’ rhinoplasty. Throughout the 20th century, technology and newer, more refined techniques have been employed to make rhinoplasty into what it is today. Generally, rhinoplasty is an outpatient procedure. This means that there is no overnight stay. You will either receive general or local anesthesia, based on the exact nature of the surgery. If you have general anesthesia, you will sleep through the operation. During the operation, the surgeon will make cuts within the nostrils. He or she will then reshape the inner bone to produce the desired results. In an ‘open’ rhinoplasty procedure, a small incision is made on the underside of the nose. This area of the nose is called the columella. Most of the time, this incision is well-hidden. With either alternative, skilled surgeons can get positive results. After the procedure is completed, patients will see some swelling and bruising. This will usually last a few days, at least. It is a good idea to wear a nasal splint for the first week after the surgery. It is also a good idea to avoid any strenuous activity for three to six weeks after surgery. The final shape of your nose will only be apparent given enough time. Adam Tattelbaum is an experienced, skillful, and personable cosmetic surgeon. If you have any questions about rhinoplasty in Rockville, MD, call us at 301-656-6398 today.